Zombie Catchers is a good game… even if you don’t like Zombies. I will start by saying that I am not a fan of zombies, or anything related to zombies. There are a plethora of zombie games that are available in the Play Store, specifically related to the aforementioned subject matter. Generally speaking, I just don’t play zombie games… until now. Zombie Catchers by Two Men and a Dog is entertaining, unique and has you running a franchise that sells unpalatable drinks… or so you would think. 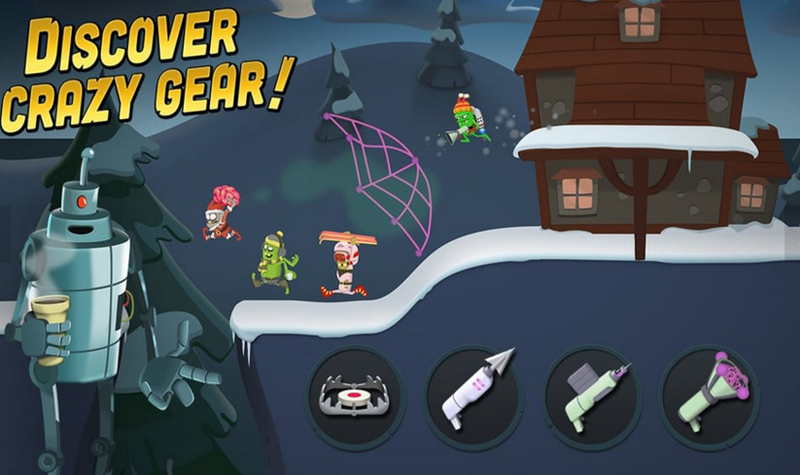 Zombie Catchers is developed by an independent game studio located in Helsinki, Finland. The founders of the studio are Matti Kallonen and Aleski Raisanen. Other members of this creative studio include Ville Heijari and Felix Westphal. What they have created in Zombie Catchers is a game that you will enjoy playing because of the original game concept, fantastic art, controls, and sound effects/music. Though I find it hard to believe, they even make zombies seem, dare I say, cute? Now that you have a brief narrative, let me break that down for you in simpler terms. A.J. and Bud are catching a variety of zombies to make zombie juice to sell to the public at large, and it works! Everybody seems to love their zombie juice. 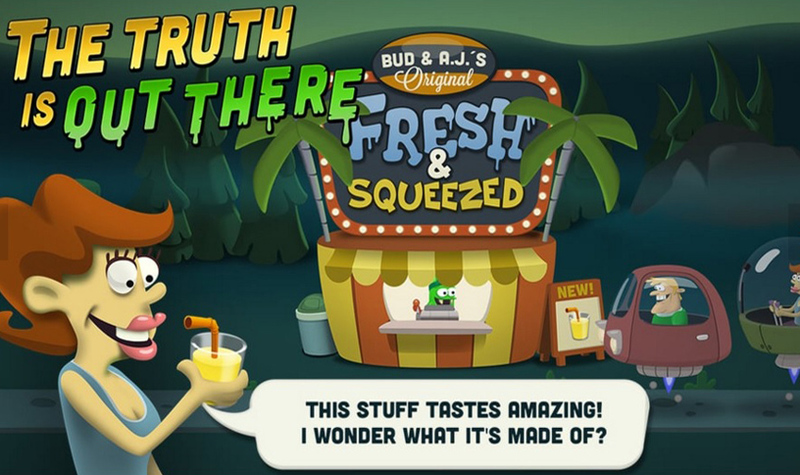 Call it the Starbucks of the future, or in this game, Bud and A.J.’s Original Fresh & Squeezed. In spaceships animated similarly to the classic cartoon The Jetsons, humans are lining up at what can be described as a zombie juice lemonade stand, to get a large variety of different zombie juices, that you put into production, after you have secured certain types of zombies. Yes, eww would be correct if that is what you are thinking. Somehow though, it makes for a great game. I think it is quite interesting that Bud is a robot and A.J. is an alien, and the humans don’t seem to mind buying their fresh & squeezed wares without asking any questions. I guess if it tastes good, no questions need to be asked. Bud pilots a ship and A.J. hops down from the ship to hunt for zombies. You start with a harpoon gun. As a side-scrolling action game, the controls work quite well. On the left side of your screen you have two arrows for moving left and right. 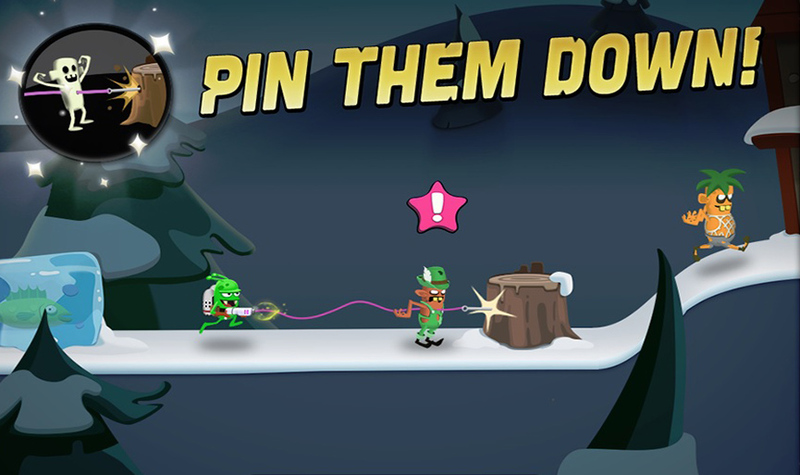 On the right side of the screen you have your jump button, the button to fire your weapon, a button to drop your lures for the zombies, and later on in the game, the ability to set traps, and use other items to your tactical advantage. Okay, this is where it gets a little weird, but fans of zombies shouldn’t be surprised. A.J. lures zombies out of the ground by sprinkling brains on the ground. As he drops brains on the ground, the smell of the brains, wafts over the soil to lure the zombies out of the ground. As they pop up and see you standing there with your trusty harpoon gun, they make a run for it. It is a good thing you also have a jetpack to aid you. 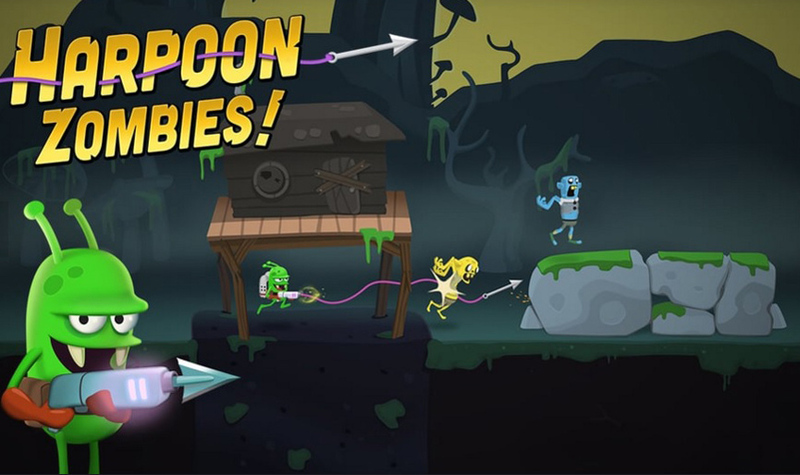 During gameplay you are jumping over obstacles and dashing in the air to catch ye olde zombies. You didn’t think they were just going to stand there to be captured did you? What makes it even more challenging, is that somehow they have hatchets underground with them, or surfboards, or other types of armor to protect them. That is why you have to upgrade your weapons, which vary from harpoon guns, to tranquilizing darts and nets. Though the bulk of the game is about catching zombies, the other part of the game is about keeping your franchise running and making a profit. If you don’t make a profit, you can’t upgrade your weapons, or send out drones, which are needed to help find where the zombies are on the planet. Once you have captured a zombie, he/she goes into a tank. You are required to have a certain number of zombies in the right combination, to make different zombie drinks. The zombies go into machines that are part of a vast underground network. There are a large number of different zombie containers that manufacture the juice, and they are connected to pipes that pump the juice up to the Fresh & Squeezed stand above-ground, where the humans are waiting in line to place their order. They can order Lemon Finger Ale, Rigorous Slushie, Apple Jelly-Billie, Lemon & Lime Popsicle, Raspberry Gutcake, Fruity Cotton Gangrene and many others. Each different type of juice is unlocked as you level up your character, and your Fresh & Squeezed stand. Like I mentioned previously, the premise is very creative, albeit a little bit sickening, when you really think about it. But hey, we are talking about zombies here, so that should be enough to make the discussion as normal as talking about the weather. Zombie Catchers is a free-to-play game. The currency in the game is structured around coins and plutonium. You are awarded coins for catching zombies, and also for selling the different types of zombie juice. You level up your juice machines, weapons, jetpack and traps by spending coins. The coins part of the game works well. You get plenty of coins from running your franchise, so this is not problematic at all. The only downside to Zombie Catchers is using drones. You can easily get two drones going to search for zombies. Unfortunately, the drones work on timers. It takes ten minutes for the drones to find zombies. Unless you put the game down, and come back ten minutes later, you really only have one drone going at a time. There is the option of watching an ad to gain use of a drone. This doesn’t necessarily bother me, but the opportunity to watch ads comes up so sporadically, it makes me wonder if it is working properly. One day I would have multiple opportunities to watch ads, and other days, they wouldn’t show up at all. You can buy another drone using plutonium, but that will set you back 180 plutonium or $4.99, which gives you 160 plutonium. You are awarded plutonium when you level up your character/juice stand. However, with how the game is set up currently, it would take a long time to get to 180 plutonium. Zombie Catchers is a really good game. The game is entertaining, and the quality of the design and production are top notch. You can’t go wrong downloading this game, whether you are a fan of zombies or not. What needs to be modified, is the rate of plutonium drops, so that you can get additional drones. There are six drones available in the game. Though you can enjoy playing the game with two of them, I imagine you would have much more fun with multiple drones on multiple maps. That really is the only thing that limits this game from being perfect. I have to play games in short sessions, so the waiting doesn’t bother me as much as it may others. Here is hoping Two Men and a Dog catch this review and implement different ways of earning plutonium in an update. Zombie Catchers is integrated with Google Game Play Services with 37 achievements to unlock and leaderboards to compete on. The game has daily challenges to complete, which also lengthens the game, and there are multiple maps, and over 33 different zombie juices to make. Zombie Catchers is definitely a unique take on the zombie game genre. You will enjoy playing this game with excellent characters, controls, music and art design. Even though it is free-to-play, you can enjoy the game without spending a dime. It is so good though, I wish I could spend a few dimes to unlock the whole game. Maybe there will be a full unlock in the game’s near future?